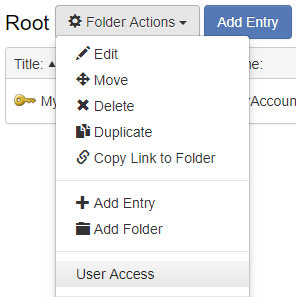 To assign Access Rules for a folder, click User Access in the drop down next to the folder name. To assign Access Rules for an entry, click User Access in the right-click menu or the Actions menu. The name of the folder or credential being modified is listed in the title. Roles are surrounded by [ ] square brackets. Users don't have any decorations. Inherited access rules cannot be deleted (those which were set on a folder higher up in the password tree). It is possible to add multiple rules for the same role or the same user. Those permissions will be combined together to create the effective permission. Since the Role "subrole_1" was assigned both "Read-only" in one row and "Write-only" in another row, the role "subrole_1" has an effective permission of Read and Write. To add an access rule, click either the "Add Access for Role" or the "Add Access for User" button and then complete the form. This feature grants access for a limited time only. The Time Limited Access feature is found on the User Access window. If the Remove Access After fields are left blank then the access remains indefinitely.